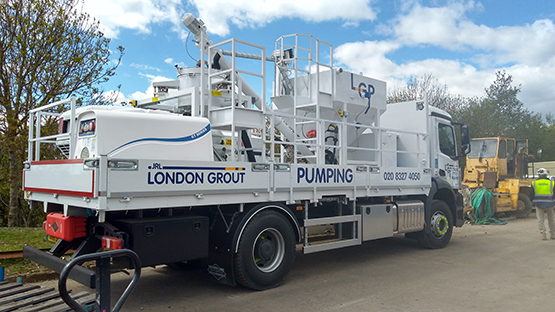 JRL Group Ltd have devised a piece of equipment known as the Grout Pump Truck. The Grout Pump Truck is a self-contained system which replaces multiple site grouting activities. This mitigates environmental impacts, namely dust and waste pollution, while also having a positive influence on safety and quality. Reduction in dust generated as hand mixing does not take place on site. This is positive for the operatives, environment and local community. Reduction in quantity of waste as a 1 tonne bag of grout is emptied into the silo prior to arrival to site, instead of using 40 x 25kg bags on site. This also reduces the number of delivery trucks coming to site, which reduces our carbon emissions. Decrease in spills when pouring and transporting grout by traditional method in watering cans. Grout is mixed using a computerised system, therefore the correct quantities of water required for mixing are programmed, ensuring no waste water. Increase in productivity and less labour intensive. Indirect savings associated with programme reduction due to efficiency of system. Grout mix is stored in the truck which reduces the risk of damage to grout material by incorrect storage on site/rain damage, therefore saving money. Minimises manual handling and trip hazards/housekeeping issues associated with traditional hand mixing methods. Uniform grout mixture created due to computerised system provides quality assurance. Entry submitted by JRL Group.